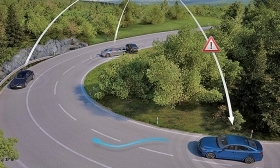 A car's sensors could warn another vehicle of a road hazard if they have a common standard. SAN FRANCISCO -- In this connected-car age, a BMW that skids on a patch of black ice could upload a message to a central database, prompting a warning for another BMW headed toward the same spot. Driving an Audi or a Lexus? You're out of luck. The mapping company Here is working to resolve that problem and to get carmakers that are accustomed to competing over everything to collaborate on a common language for reporting sensor data to the cloud. "We believe, and they believe, that this is a noncompetitive environment," said Dietmar Rabel, director of product management for automated driving at Here, the Nokia unit being taken over by three German automakers. "The competition is about the algorithms for how we use the data. This is where the differentiation happens." Here, which supplies maps to most cars sold with onboard navigation systems, has embarked on a roadshow to advance the idea that the auto industry should settle on its own standard, rather than waiting for a company such as Google or Apple to step in and dictate one. Here held a meeting in August in Berlin to outline its proposed "sensor ingestion protocol." In early October, it held a confab in the Detroit suburbs, attended by marketers and other executives from Fiat Chrysler Automobiles, Ford Motor Co. and General Motors, as well as suppliers Inrix, Robert Bosch GmbH and TomTom. It plans another meeting in Japan in November. Here has presented its own protocol as a template. One of the company's existing customers -- a "very high-value customer," Rabel said -- is already using it for a traffic sign recognition feature. The next step is using the system to detect that a road has shifted. If it has been rebuilt 10 or 20 feet from its original location, other cars will know. The challenge with a common language will be deciding how the language will evolve over time, said Steve Banfield, the chief marketing officer at Inrix, which uses anonymized data from cars and smartphones to beam down live traffic data. "The devil will be in the details," he said. "How do you come up with a governance model that works well for the data aggregators such as us and TomTom but also works well with the OEMs with regard to security and privacy and allows them to get the services they want?" Rabel said Here isn't trying to ensure that its language is chosen but that a language is chosen. The industry won't unify if someone dictates the standard. "In this industry," he said, "you can't be a player and a referee at the same time."